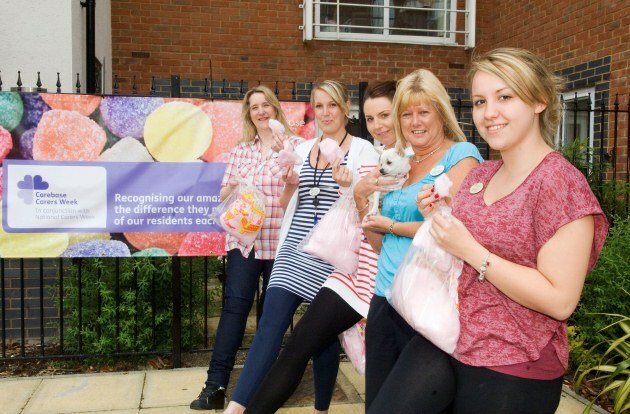 Carebase’s Carers week took place last week from 10 – 16 June and was the perfect opportunity for Carebase to say a huge thank you to the dedicated staff and amazing teams that offer such wonderful care and compassion to the residents in its homes and for the difference they make to the residents’ lives each and every day. Carers Week recognises and celebrates the hard work the staff carries out and is Carebase’s way of saying a heartfelt ‘thank you’ for the personal responsibility the teams take in delivering excellent care every day. At Carebase all team members are considered carers, from domestic staff to gardeners, as they all play an integral part in the well being of the residents in their care. This is the third year that Carebase has celebrated its carers in this way. The week was fun-packed and full of wonderful treats for the teams, including an ice cream van that visited each home, a luxury nut and chocolate hamper, old fashioned and retro sweets, pop corn and candy floss carts, cakes and cookie towers and much more.